When I was six years old, my mother had a heart attack, thrusting me onto a new path in my life that I didn’t understand the importance of until I was older. In fact, it never really bothered me to care for my mother. I made her drinks, helped her walk again, helped cook and clean, did the washing, and walked the dogs because she couldn’t. My sister and I never complained, nor did my father—it was just a thing that was understood. I didn’t know any different. Fast-forward sixteen years or so, and me and my sibling are still looking after my mom. My dad too, this time, as age starts to get the better of him. We clean, we cook, and we make sure to watch over the medication of our parents, whose memories are not entirely up to snuff. At the same time, we have our own lives, too. My sister is getting her master’s degree in psychology. I freelance full-time. It’d be an understatement to say we’re busy. Being busy means we can only take snatches of time to get into things. My thing? BanG Dream!, a girl band mobile game. It had just gotten a western release when I first started playing. After getting to know the songs and loving the characters and voice actors, particularly the band Poppin’ Party, I devoured every sort of media of my fixation, starting off with the first season of the BanG Dream anime. That was when I watched Saya’s arc and proceeded to cry my eyes out. deep in my memories, a small voice called out, echoing out. Saya Yamabuki is a high school student who’s described as very kind and dependable. She’s one of the first people who befriends Kasumi Toyama (the main protagonist) without hesitation. Later on, Kasumi asks Saya to join the band, but she’s extremely hesitant to commit to it. From my perspective, it’s easy to see why. Much like myself, Saya is a caregiver for her anemic mother. She was originally in a band in middle school, but had to pull out of an important performance at the last minute and eventually quit the band because her mother fell ill.
As a result, Saya closed herself off from the world around her. She distanced herself from her friends, limited her time to spend it mostly at home, and took on the motherly role of looking after her brother and sister. Before she even realized it, her life was put on hold. I could relate. I first noticed a difference for myself when I hit my teenage years, where social pressure started to weigh in on me. I was an overweight, stressed-out kid who was fairly quiet, but I had enough friends that I started to get asked out to parties. Thinking of my mother, as well as my older father who struggled to care for her, I always declined going out and I never stayed over late. I soon started receiving fewer and fewer invitations, until I eventually stopped getting anything. I, like Saya, never told anyone why I couldn’t go out with them. Most of all, I felt like I couldn’t tell anyone. I didn’t want people to treat me differently. Even when I hinted that my mother was ill, I felt as though I was being overtly pitied. And just like Saya, I could barely stand it. I was sure of one thing: if my mother got hurt while I was away, actively enjoying myself, then the guilt would kill me. It’s this guilt that makes Saya hesitate to do anything too. It’s an innocent phrase, but to the viewer it’s obvious that Saya doesn’t feel that it’s possible. In fact, going out would only confirm to her the guilty feeling that she doesn’t do enough—something she already feels whenever she sees her mother slumped over or falling while working in the house or their family’s bakery. However, what’s significant about BanG Dream’s first season is that it manages to capture Saya’s feelings of guilt without turning her or her mother into a victim. The narrative never treats Saya’s mother as an object or characterizes her as overtly weak. She is instead depicted as a caring and loving woman who also happens to be ill. She is defined by her dedication to her family, not her illness. Saya, too, isn’t defined solely by her role as a young caregiver. 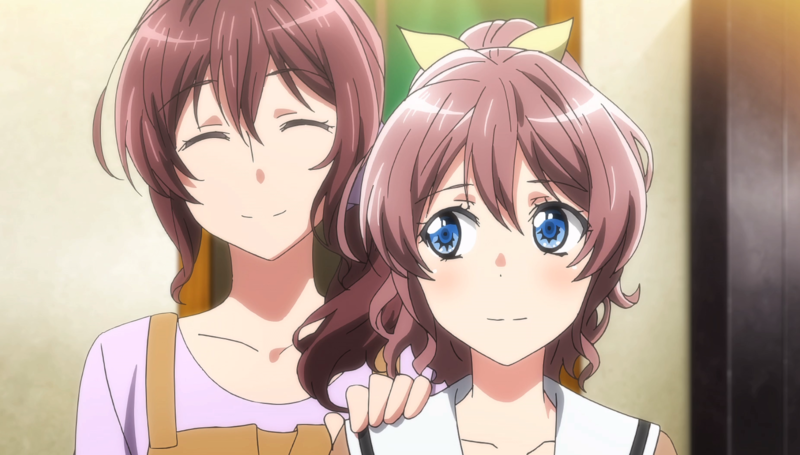 While being one is significant to who she is and the reason I strongly relate to her, she’s also a big sister-figure to the girls of Poppin’ Party. She’s often there to help them with their problems, such as reassuring Kasumi that she’s not weird and will find her place in the world, or understanding Arisa’s introverted nature and not judging her for it. And the most important part? She never asks for anything in return. Even the characters outside of the Yamabuki family don’t treat Saya or her mother as victims. On the contrary, when Poppin’ Party help Saya and her mother out at the bakery, they don’t treat her as sickly or regard Saya with any pity whatsoever. Instead they share laughs, eat dinner, and act respectfully to the Yamabuki family. It highlights how caregivers and those in their care should be treated in the first place. Watching that, I felt heard for the first time. I was shocked that I’d managed to discover media that understood my life as a caregiver so well. There are so many stories out there that would have you believe that being a caregiver, or being cared for, is a terrible, soulless, and thankless life. But that’s far from the truth. It’s hard, yes, but life goes on and the people who love you—the people who matter—stick by you. I’d never felt that was more true than when watching Saya’s arc. It is also vital that BanG Dream’s narrative rejects expectations about what the Yamabuki family’s “happy ending” should look like. Mrs. Yamabuki doesn’t suddenly get better or die to “free” Saya from her role as a caregiver, as is so often the case in stories like these. Instead, both Mrs. Yamabuki and Kasumi confront Saya about hiding her feelings away and the damage that it is doing to her. When Kasumi finds out why Saya left her old band, she talks to Saya about how she wants her to join Poppin’ Party. She argues that Saya would be an excellent addition and that they’d have fun together. Saya refuses and continues to do so until Kasumi, confused, asks if it’s because she doesn’t love bands or even music anymore. But this is far from the truth. Just like me, Saya believes that someone will end up suffering for her sake. Whether that’s Poppin’ Party’s career or her mother’s health, she can’t bear to think of it. To Saya, that is her reality. Her doing something for herself, outside of her own safe and personal bubble of caring for her mother, is inherently selfish and deserves punishment. She believes stepping out of line and taking a risk leaves everything open to go wrong. When she’s with her mother, caring for her, she has a semblance of control; a belief that nothing will go wrong if she is there. As a teenager, I felt the same way. Even in adulthood, it’s hard to let that line of thinking go. If I’m out of the house and things fall apart, who will be there to pick up the pieces? Distancing myself from everyone and everything I loved was key to being in control. BanG Dream’s depiction of being a caregiver is spot on, not just with Saya, but with me too. In the anime, Kasumi breaks the circle of Saya’s guilt and paranoia-induced thoughts, pulling her back from the abyss by saying: “You can’t make these decisions for us [her friends]. It isn’t fair. Let’s think this through, together!” As far as the audience knows, this is the very first time—outside of her family—that someone has told Saya the world wouldn’t fall apart if she did something for herself. Something similar to this also happened to me. With a friend taking me to the side and pretty much asking the same thing: “When are you going to start thinking of yourself as well?” Like Saya, it came as a shock to me, to have someone say something so blunt to me. It made me question what was actually holding me back from doing the things that I loved—writing, volunteering in charity work, baking. Was it me? Was I the one thing holding myself back? What shocked me more was that my friends weren’t leaving me. Just like Kasumi to Saya, they wanted to stick by my side and help me. When Mrs. Yamabuki collapses the next day, Saya goes with her to the hospital and misses the Cultural Festival. Kasumi, however, doesn’t turn her back on Saya. She leaves voicemails checking up on Saya and her family, and writes a song dedicated specifically for her. The song “Star Beat” talks about love, kindness, and reaching a day that Saya and Poppin’ Party can perform together. The song touches Saya’s heart with the knowledge that there are people out there who will wait for her, no matter how long it takes. It is then that Mrs. Yamabuki herself encourages Saya to be kind not only to other people, but to herself. She tells Saya not to bottle up her feelings anymore and to do what she wants to do. She’s a kind girl and cares about others. But sometimes, that kindness needs to be given back to herself. She promises her daughter she’ll support her, no matter what. Both Kasumi’s love and her family’s support dissuades Saya from her belief that something bad will happen if she goes out and has fun with her friends. Instead they show Saya that the thing holding her back wasn’t her mother, but herself. It is at this point that Saya’s story reaches full circle. While not 100% unaware of the way she’d been neglecting herself, Saya’s decision to join Kasumi and the others in the band shows that she is taking her first step away from her old life. The result is that Saya bonds with the rest of Poppin’ Party, helping them out with band practice and performing at SPACE. She becomes happier with herself, especially knowing now that she can simultaneously be both a caregiver and a member of Poppin’ Party. Saya’s story is a hopeful but very accurate depiction of what being a young caregiver can be like. More importantly, it shows how easy it is to fall into neglecting yourself in several different ways, as well as damaging your relationship with the people around you due to guilt, fear, and the feeling that you’re being a burden. While I still haven’t quite learned how to balance caregiving, work, and a social life, I’m actively working on it. I no longer hide that I’m a caregiver, for one, and when I’m invited to social gatherings I don’t immediately feel dread. I instead plan it out with my sibling on whether she can handle looking after my parents for the night or not, and vice versa. I also continue to spend my time in the world of BanG Dream and feel closer than ever to these girls as they try and figure out their place in the world. I’ve even made friends through the game. And while I don’t think I’ll ever join a band, Saya’s story has empowered me to know I can tackle whatever the future brings at the same time as caring for the people around me. It isn’t perfect—the world rarely is—but it’s a step in the right direction. Aimee Hart is a freelance writer who was raised in the little town of Dudley in the UK. She's had bylines in Game Revolution, Unwinnable, Bloody Disgusting and is currently working for the website VGR and the magazine, Switch Player Magazine UK. Despite the onslaught of games, she still has enough time and money to shell out to Crunchyroll every year, and you're able to see her crying about BanG Dream at her account @honhonitsaimee on Twitter.